The executive committee members have decided to <?</SPAN>organize one day trip to Murudeshwara for our members and their family members on Sunday, 30th May, 2010. Murudeshwara (Kannada: ಮುರುಡೇಶ್ವರ) is a town in the Bhatkal Taluk of Uttara Kannada district in Karnataka State, India. "Murudeshwara" is another name of the Hindu God Shiva. 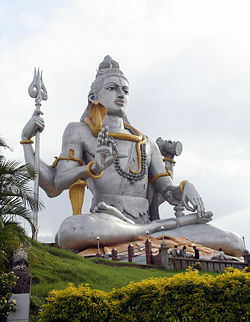 Lies on the coast of the Arabian Sea is famous for the world's tallest Shiva statue and <?<span>Murudeshwara Temple. It is <?<st1:metricconverter w:st="on" ProductID="165 km">165 km from Mangalore on the <?xml:namespace prefix = st1 />National Highway attracting lot of devotees and tourists to the place. The beach, temple, restaurants, guest houses, resorts & beautiful gardens are worth seeing. We are planning to start from Mangalore by train (Konkan railway) on 30th May 2010 at 6.15 am which reaches to Murudeshwara at around 11 a.m. After visiting the Murudeshwara Temple and Raja Gopura, Murudeshwara Fort, the finest beach, let us return back to Mangalore by train at 4 pm which reaches Mangalore at around 7 pm. So far we the members met together for several academic activities and enriched and shared our knowledge. Now let us join together to relax for sometime from this hectic working schedule and share our views and thoughts and enjoy at beautiful piligrimage Murudeshwara. I request you all to BE PART OF THIS COOL PICNIC and please prepare to present your own hidden talents to your professional colleagues. Kindly come forward to entertain the members and conduct some games to the fellow participants. If you need any further information do not bother to call the following executive members. I REQUEST ALL OF YOU TO CONTRIBUTE Rs.500/ per head. (Approximate). If the amount remains it will be distributed equally to all the members. Kindly bring your family members too to make this picnic a memorable one. Kindly confirm your participation by 15th of May.